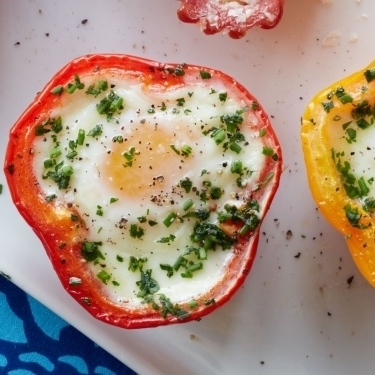 This pepper egg cup recipe is a great way to start you day with low carbs and high protein. With only 10 grams of carbs and 18 grams of protein, this breakfast idea will warm you up and fuel your body for a great day. Counting points or calories instead of carbs? No problem. You will find nutritional information and Weight Watchers points, including the new smart values for this recipe below. This is a fairly simple breakfast recipe but does require some cooking time. So pop it in the oven and get ready for work. By the time you are done getting ready, these will be ready to eat. For you members who are following the FreeStyle method, this can become a zero point breakfast by skipping the bacon and cheeses. Remove seeds and tops of bell peppers. Cook bacon to desired crispness, crumble. Place cheddar cheese and crumbled bacon into pepper halves. Crack an egg on top of cheese and bacon. Place in oven for 20 minutes or until egg whites and firm and yolks are still runny. The nutrition facts for this recipe are shown below are per serving. The number of serving is noted in the header section below. The serving size is the first item noted on the nutrition facts table. The nutrition values for the peppers and eggs in this recipe were not used when calculating the Freestyle smart points. The peppers were not included in the calculation the remaining Weight Watchers points..
You can alter these egg cups in many different ways to meet your diet needs. You can use egg whites, low fat cheese or even skip the bacon for a healthier version. If you enjoyed this Pepper Egg Cup Recipe try this breakfast casserole.. 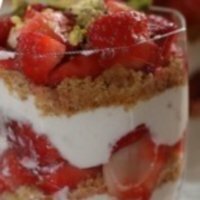 If you are looking for a quick and easy breakfast idea, then try this sweet and satisfying parfait. 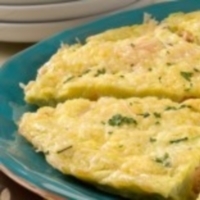 This healthy frittata combines salmon and veggies to make a nice egg bake for breakfast. 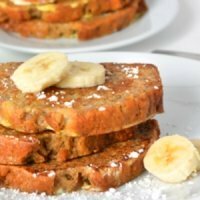 This French toast recipe is perfect for using up your left over banana bread. 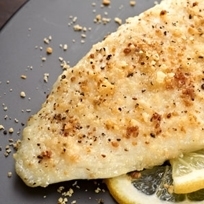 Try this parmesan tilapia for a lighter fish taste and a great healthy source of omega-3 fatty acids. Add a little heat to your appetizer with these potato boats. 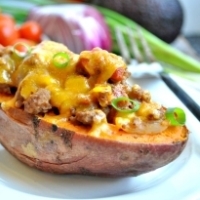 It's a spicy twist on potato skins to start your meal out with fun flavors. This burger is made with ground turkey (for a healthier option) and stuffed with lots of flavor. See how long it will take you to reach your ideal weight with this free online calculator. Use these tips to change your diet for a skinnier and healthier you. Add some of these power foods to your meal plan.